Quick post today, guys, cause I have a feeling you might still be worn out from yesterday’s feast! And I can bet you are now puzzledly looking at all those leftovers, thinking “Why do I always have to make so much food?” while hopelessly pulling your hair. But what if I told you there is a way to revamp all that food into something delicious? Tim and I decided to go low key this Thanksgiving. We chose to stay home watching the last Hunger Games, getting ready to maybe go see the new one today this weekend! And, since I made a turkey for the blog last Sunday, we had a lot of turkey leftovers this week. You see, my husband has no problems eating leftovers all week long. Me, on the other hand, not so much! Especially turkey… There is something about reheated turkey that just makes me flinch. 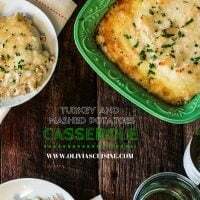 So, I took Antoine Lavoisier’s advice – “In nature nothing is wasted, nothing is created, everything is transformed.” – and transformed our leftovers into an amazing, easy casserole that is inspired by the Brazilian version of a shepherd’s pie: escondidinho! Easy as in: sauté some onions and garlic, add the turkey and the gravy and voila, the filling is ready. 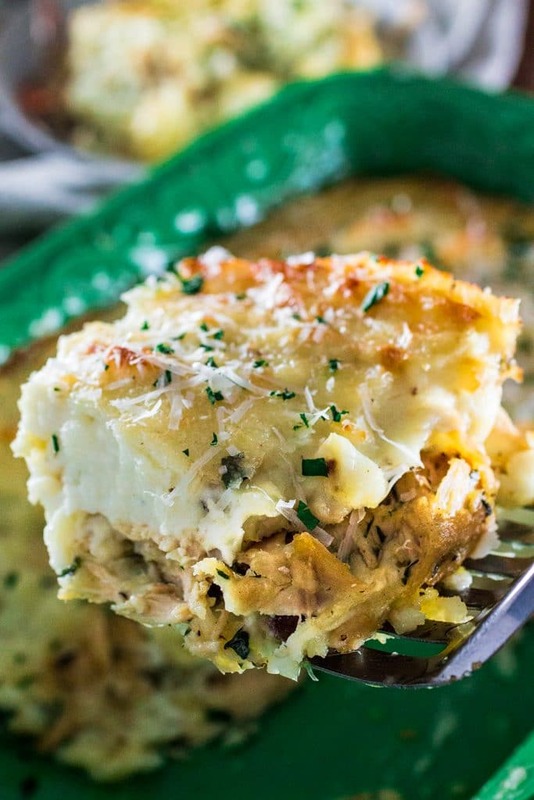 Then, cover with mashed potatoes, sprinkle a whole lot of parmesan cheese and bring it to the oven until the top is bubbly and golden brown. ? You could also add some requeijão (or cream cheese) and/or whatever veggies you have left, like carrots or brussels sprouts, to the filling. Some olives might be good too! Oh, and in case you are doing the whole Black Friday thing, don’t forget to take a peek at my 2015 Holiday Gift Guide for Foodies for some fun ideas! In a large skillet, over medium high heat, heat the olive oil and sauté the onions and garlic until translucent (about 2 minutes). If your mashed potatoes have thickened too much in the fridge, add 1/2 cup heavy cream to loosen it up a bit. Spread 1/4 of the mashed potatoes to the bottom of a lightly greased 9X13-inch baking dish. Layer the turkey filling right on top of that and finish with the remaining mashed potatoes on top. Sprinkle the parmesan on top and bring the casserole to the oven. Bake for 30 minutes or until the top is bubbly and golden brown. Top with some more parmesan cheese, if desired! This is such a creative idea, Olivia! 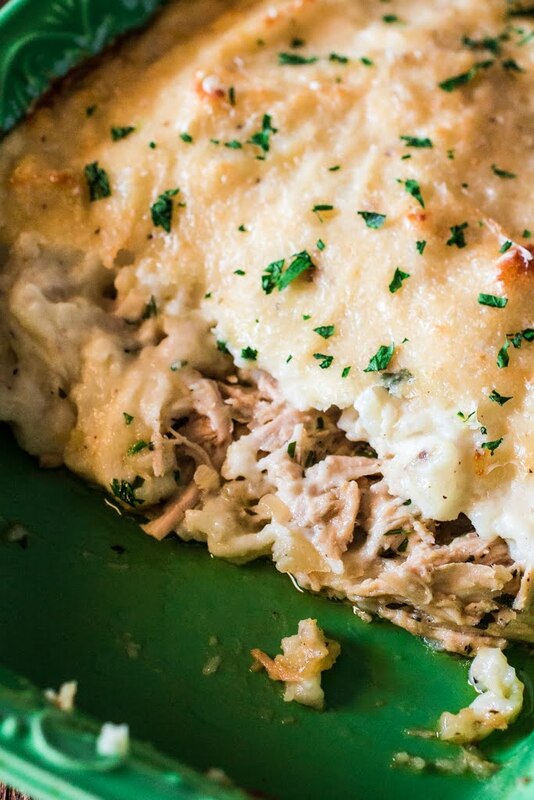 I do love a shephard’s pie and I have all of these things in my fridge because we have a ton of leftovers! Oh WOW! This was a total winner the day after Thanksgiving. I had lots of compliments as well as a request for your recipe. Thank you for making our post-Thanksgiving dinner such a success. This was delicious! My whole family loved it! I will definitely be making it again. 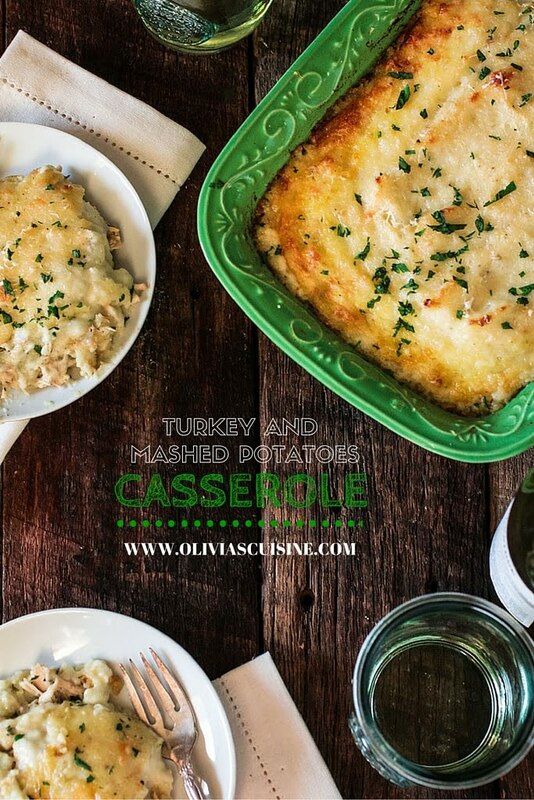 This is my favorite recipe now for Thanksgiving leftovers. I improvised and used stuffing in the bottom layer and added extra cheese to the potatoes.. went over great . gonna try this part. i wanna get ride of my stuffing as well!